March has arrived! Does anyone else feel like February was missing a couple of days, because I sure do. The weeks are ticking down faster than ever… But let’s not talk about that. We are still enjoying the last icy grips of winter here in Missoula. I was surprised at how cold I was this week, and I realized that it was because it was really windy, which it usually isn’t here. I guess Heavenly Father is reminding me of my Okie roots. 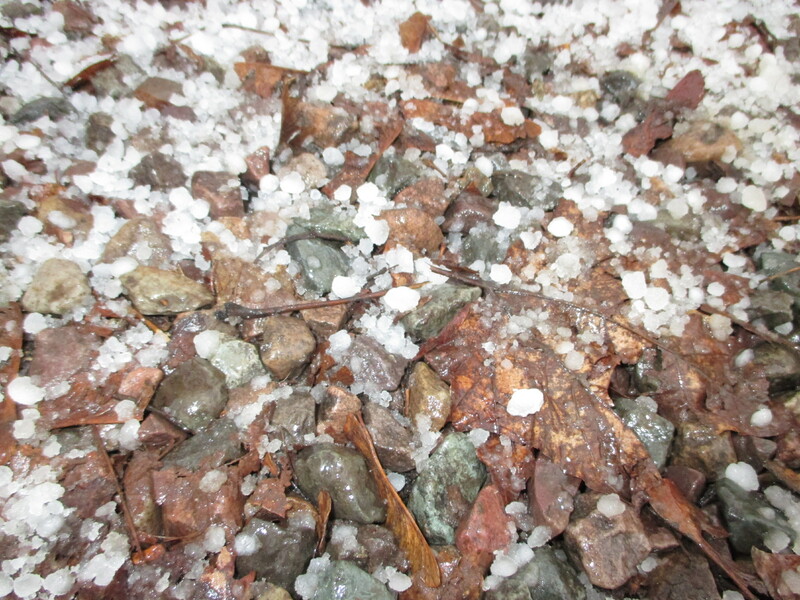 Montana’s sad attempt at hail! We saw come good progression from out investigators this week! Pauline, who is the mom of our recent converts Mary and Jessica, finally set a firm baptism date for March 21st. We had visited them on Tuesday and we had a “come to missionary” meeting where we had to re-establish our purpose with them. It went really well, and they all started progressing again. Our investigator Adrianna is also in the midst of making some big decisions right now about baptism, marriage, etc… please keep her in your prayers! So my cool story of the week starts last Sunday. One of our members, Travis, came up to us after sacrament meeting and said, “Hi sisters, come meet my non-member friend that I brought to church with me!”. We laughed and of course trotted over to meet his friend. The friend, Cody, has gone to church off and on for number of years (we found out later that our bishop actually assumed that he was a less active member). My conversation with Cody essentially went like this: “So what’s your story?”, I asked. He responded, “I really like coming every now and then, I like the people that I meet here, they all seem really great. I’m not a member or anything though.” The response that came to my mouth HAD to have been the Spirit because I said it without even realizing… I said, “So, you wanna join??”. He looked at me thoughtfully and responded, “hmm, maybe!”. We set up a lesson for Wednesday night, and the lesson went so well! We did it at his member friend Travis’ house. We focused on meeting his needs and establishing our purpose and vision. It was really powerful. He committed to reading the Book of Mormon. I followed up with him on Saturday via Facebook, and he was already halfway through 1 Nephi! When we asked about his associated prayers about it, he told us, “I realized that I need to pray more when I read. It helps me understand more and feel better”. Yes, yes it does! He came to church again on Sunday and was still reading the Book of Mormon even during church. (Haha) We are meeting again this week, and I am so excited to help him in this journey! On Thursday and Friday, we had exchanges with our Sister Training Leaders, and it was so fun! I was with Sister Nonne here in my area, and Sister Moore went with Sister Martin to 5th Ward. Sister Nonne came into the mission field with me, and we talked about how we were both on each others’ dream companion lists, haha. We had a bunch of appointments those days, and it went by so quickly. On Saturday, our zone had interviews with President Holmes, who is a member of the mission presidency. It was wonderful! Pres. Holmes gave me some very inspired counsel and guidance. I am so grateful for priesthood leaders on whom I can rely. 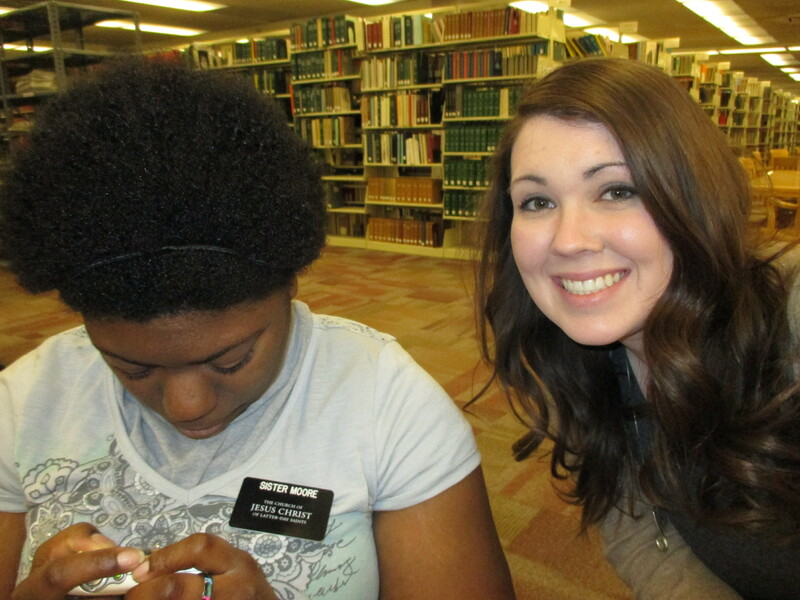 C’mon Sister Moore, take a selfie with me! This week will be an exciting one- we are having an entire mission meeting in Bozeman on Wednesday! This is the first time in TEN years that the entire Montana Billings Mission has gathered in one place. We will be hearing from Elder W. Craig Zwick of the 70 and Michael Hemingway of the Missionary Department. It will be entirely focused on Missionay Work in the Digital Age, so we’ll be talking about Facebook and iPads primarily. We got drafts of the new handbooks for digital use, and as we each reviewed them, we kept thinking, “hey, we’re already doing all of this”. And then it dawned on us… we are the ones who figured out and created the rules in the first place! So I’m not anticipating anything particularly new on Wednesday, apart from information about the new devices that the mission will be receiving this summer. It’s exciting times to be in the Montana Billings Mission! That’s about it for me this week, so I’ll just wish you all the best, and know that I love you and pray for you all! Have a happy week!